At the southern end of the Pennine hills deposits of lead have been worked since Roman times and possibly before. Ingots or ‘Pigs’ of lead from the Roman occupation have been found at a number of sites in the area and subsequently lead mining has been an important part of the local economy. Most recently fluorite and barite have been worked, by opencast methods where possible, with localised workings for calcite and high purity limestone. 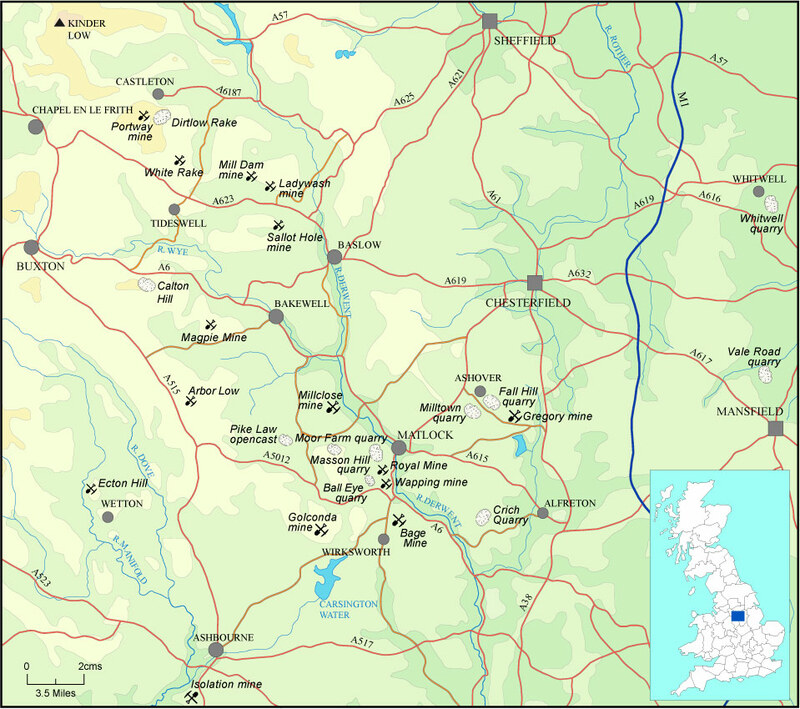 By virtue of the small scale nature of many of the mining operations, there are many thousands of old mines, most undocumented, and even today in some areas of Derbyshire the remains of shafts, opencast workings and tips are still the dominated feature of the landscape. Minerals of the Peak District, a joint Publication of the UK Journal of Mines and Minerals (Issue 13) and the Peak District Historical Society (Vol. 12 No.1) gives a full description of the geological environment and the mineralising processes. The main locations that have produced specimen-quality minerals are listed below. Permission should always be sought before considering a visit and underground exploration should not be contemplated as it is dangerous. Famous for the unusual and attractive brown/orange banded barite of stalactobotryodial form, locally known as “Oakstone”. The barite takes a high polish, and when skillfully worked show ‘eyes’ formed from small concentric rings of contrasting coloured material. 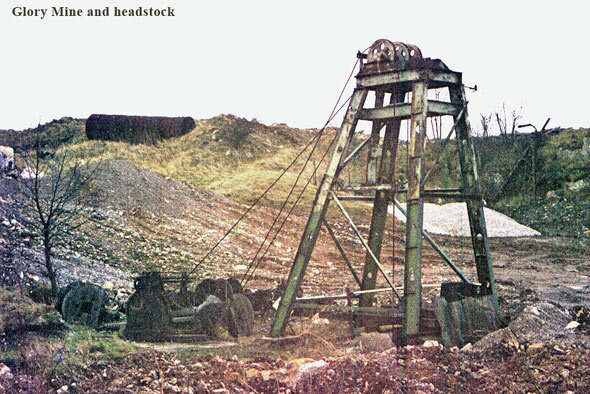 Bage mine is one of the classic locations in Derbyshire, being the type locality for Matlockite. Phosgenite, locally called Cromfordite, was also found here in the 19th century, although recent exploration has found neither. Anglesite, galena and barite also occur. Dark blue fluorite, barite, malachite, cerussite, smithsonite and anglesite. Quarrying exposed an outcrop of volcanic rock with many cavities containing small crystals of amethystine and smoky quartz occasionally in association with hematite included Calcite crystals. limestone quarry. The honey brown fluorite is fluorescent, unusual for Derbyshire. Cerussite, smoky quartz and galena found here too. World renowned for the deposits of banded fluorite called Blue John which for many centuries has been worked into attractive jewellery and an amazing variety of decorative objects. Each of the Blue John veins in and around Castleton have a unique and distinctive colour banding which allows specimens to be provenanced to a specific vein. There are 14 in all with names such as Winnats 1, Cliff blue etc. Extraction of material is now strictly limited but good examples can be seen in the shops and museums in Castleton village and in the show caves nearby. Large opencast, worked for barite and fluorite into the 1990’s. The fluorite can be either clear with pyrite inclusions or small purple cubes associated with coxscomb barite and scalenohedral calcite. Also found here were unusual forms of barite either in convoluted tube shaped masses or spiral aggregated crystals etched out of calcite by collectors. Now landscaped over. Strictly the mine is in Staffordshire but it was part of the Duke of Devonshire’s royalties. The richness of the mine in the late eighteenth century paid for the building of the Crescent at Buxton by the 5th Duke. The mines are known for azurite, malachite, chalcopyrite, cuprite, sphalerite and large calcite groups. Smaller mines in the area have produced good secondary minerals from the tips particularly Waterbank mine (SK102576) where brochantite, aurichalcite, serpierite, posnjakite, ramsbeckite, namuwite, hydrozincite, cerussite and smithsonite have been found. 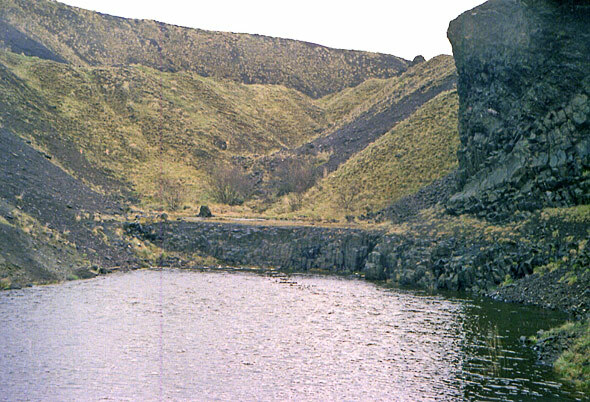 A relatively small quarry, worked for fluorite in the 1970’s and 1980’s but now partially flooded. Millerite occurs as filaments in calcite veins traversing the toadstone. Excellent beds of clear and included fluorite cubes to 50mm, sphalerite crystals, sometimes with greenockite coatings, marcasite, hydrocarbons and sharp ‘dog tooth’ calcite crystals in the limestone. The location for probably the best Derbyshire aurichalcite associated with beds of white/grey crystallised hemimorphite on barite. Old time specimens of galena are some of the best to come out of the UK. Excellent specimens in Truro museum. Enargite. Sphalerite including red ‘ruby’ type, Large display specimens of clear to grey fluorite often pleasingly associated with calcite, Occasionally wulfenite, marcasite, chalcopyrite and attractive fluorite/barite banded specimens. Beds of small purple fluorite cubes and larger clear crystals. Sharp lustrous calcite crystals occasionally double terminated, marcasite. Large sprays of light brown ‘dog-tooth’ calcite, sphalerite. The mine is now a Field Centre, for the Peak District Mines Historical Society. Worked in the 1980’s. Galena crystals, cerussite, fluorite, either clear or amber coloured usually with pyrite inclusions. Grey pseudo-stalactitic barite. This was the largest mine in the district producing some half a million tonnes of galena. Galena, sphalerite with greenockite were found here as well as large scalenohedral calcite groups, with marcasite and fluorite. Mill Dam mine was the last mine to work specifically for fluorite in Derbyshire. Excellent clear calcite crystals, fluorite (clear and dark purple), anglesite and wulfenite. A disused quarry into which large amounts of industrial slurry have been dumped. Ashoverite, anglesite, calcite, cerussite, fluorite, galena, hydrocerussite, palygorskite, smithsonite, sweetite, and weddellite were found here. (see UK Journal of Mines and Minerals Issue No.10). This was worked opencast into the 1990’s for barite. Large boulders of barite which when sawn and polished produce specimens showing attractive patterns from concentric bands of different coloured barite. Typical clear and included fluorite in the limestone. Toadstone outcropped in the north end of the quarry within which small veins of deep purple fluorite occurred, reminiscent of the material from Castleton. The toadstone also produced small specimens of green pyromorphite. Provided good collecting in the 1970’s before it became part of Gulliver’s Kingdom. Excellent hemimorphite with fluorite, banded aragonite, marcasite, smithsonite, cerussite and calcite. A working quarry, extracting roadstone from the interbedded dolomatised limestone and mudstones of Permian age since 1967. Small cavities in the dolomite contained barite, pyrite, calcite and galena and sphalerite. 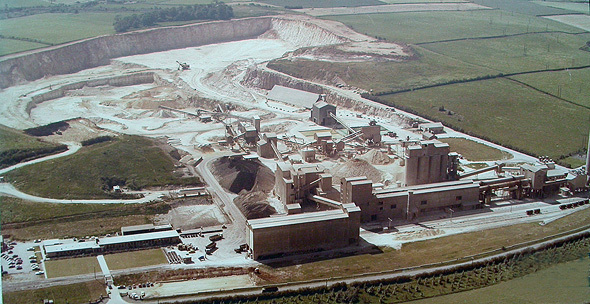 A large quarry on the border with Nottinghamshire, extracting magnesian limestone of Permian age. Historically little of mineralogical interest has been found from the magnesian limestone deposits but in the 1980’s significant finds were made from a fault crossing the quarry containing mixed lead/vanadium mineralisation. Its importance was in the quality of the vanadium minerals vanadinite and descloizite, probably the best yet to be found in England and the secondary lead mineral suite including leadhillite, lanarkite, cerussite, anglesite, pyromorphite, scotlandite, mattheddleite and possibly susannite. Other minerals found were barite, calcite, hemimorphite, and sphalerite. A number of mineral specimens have yet to be identified. An amazing complex of workings which link through to Cumberland Cavern. Many areas of large dog-tooth calcite, fluorite, cerussite, hemimorphite and barite in thin blades resembling mica. White Rake, Great Hucklow (SK165640). Good cerussite specimens for Derbyshire with anglesite and pyromorphite in small crystals.